Montgomery County is a county located in the state of Indiana. As of 2010, the population was 38,124. Montgomery County was created on March 1, 1823. 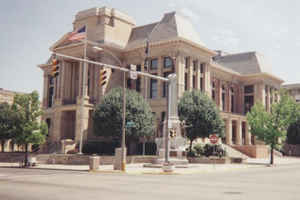 The county seat is Crawfordsville. The county is named for General Richard Montgomery, hero of the American Revolutionary War. The county is named for Revolutionary War Major General Richard Montgomery. The first county election was held in Mar 1823. 61 people voted in that first election. The first three county commissioners were elected - William Offield, James Blevins and John McCollough - who then ordered that the first jail and courthouse be built. Montgomery County is divided into 11 Civil Townships as follows: Brown, Clark, Coal Creek, Franklin, Madison, Ripley, Scott, Sugar Creek, Union, Walnut and Wayne. As reported by the Census Bureau, the county has a total area of 505 square miles (1,309 km2), of which 505 square miles (1,307 km2) is land and 1 square mile (2 km2) (0.16%) is water. Montgomery county is located close to the center of Indiana. Pine Hills Nature Preserve and Rocky Hollow Falls Canyon Nature Preserve are in this county.